For the past four months I have grappled with writing a review of Caron Infini. Not that I’m turned off by this once-venerable house, like most are. (Yes, like everything, things have changed; thus, I keep my expectations low.) Probably it has more to do with coming to terms with a perfume of my mother’s generation – one that represents not revolutionary fervor but upper-middle-class entrenchment – and finding its restraint unexpectedly beguiling. 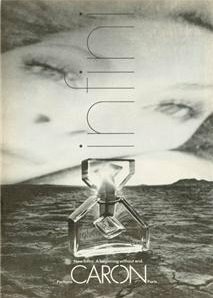 Despite its being a skin-scent after about 20 minutes, Infini in the EDT concentration is perhaps a better representation of the 1970 formula, which I have only been able to confirm was made in extrait, EDC, PDT and EDT. According to Jean-Yves Gaborit in his book Parfum: Prestige et Haute Couture (Fribourg, 1985), the formula contains Grasse and Bulgarian rose, jonquil, lily of the valley, iris, peach, plum, vetiver, sandalwood and civet. (No doubt, minus the civet since Alès Group took over Caron in 1988.) 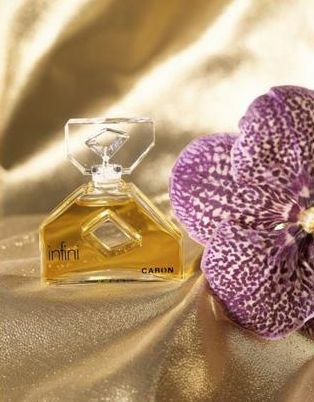 The Caron Web site mentions only tuberose, jonquil, sandalwood, vetiver and lily of the valley. To my nose, there isn’t a tuberose to be found for miles. Instead, what I get is a very pleasant – and short-lived – rose accord followed by a sustained white floral aldehydic of the squeaky clean, soapy variety which would reach its full realization in Sofja Grosjman’s White Linen for Estée Lauder in 1978. On those attributes alone, I’d take White Linen any day, but Lafort’s skill here is apparent in a space-age green metallic note that half-reminds me of the smell that Reynold’s Wrap tin foil gave off when I was a kid and, more recently, a herbal metallic facet of the green opening notes of Creed Original Chèvrefeuille. 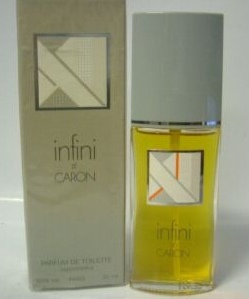 With a genealogy so long and confusing, I begin to wonder whether Infini weren’t some elaborate pun for a fragrance that will be reinvented for ∞. I'm a fan- of Mansau's edgy, timelessly appealing bottle- and the jus itself, which I find spicy, lovely, and very pleasurable to wear. Thank goodness, this isn't ruined- yet. No, Chaya, not ruined yet. In moments of crass misanthropy I almost wish for a Perfume Crimes Court in The Hague! "one that represents not revolutionary fervor but upper-middle-class entrenchment" is the line that instantly caused me to add this (parfum version) to my next TPC order ;) now I can't wait... great review! I love your writing! I was never an especially ardent fan of this one, but then my animalistic proclivities were seriously damaged when civet was removed. However it gives pause for thought: first LT "demolished" the house of Guerlain (but they managed to reverse the climate and are selling just as much, if not more now), now he has the house of Caron...It's rather eerie, isn't it?